Callum Camps set Rochdale up for a hard-fought win over League One leaders Burton Albion at a snowy Spotland. Midfielder Camps picked up the ball 25 yards out before unleashing a rasping drive into the top corner to give the home side the lead. Ian Henderson soon doubled Dale's advantage from the penalty spot after he was fouled by John Mousinho. Lucas Akins' exquisite lob pulled one back for Burton, but Rochdale hung on to see out victory. Burton Albion remain top of League One following Gillingham's defeat at Blackpool, while Rochdale move up to 14th. "Two thirds of the performance was superb. I wanted to reassure myself and the players that there's no crisis at the football club. "Progressively, I want to try and establish ourselves and take us close to being a Championship side. "If we'd lost the game but performed like that, I would have been reasonably happy." 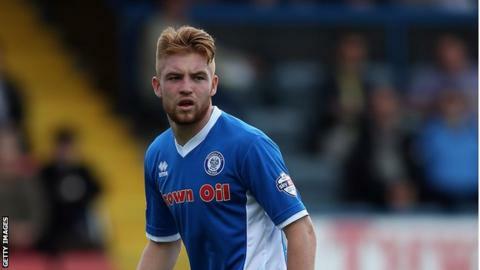 "We stressed to the players after Tuesday night that this is Rochdale now. We knew what the pitch was going to be like. They've had a lot of rain up here. It was going to be a difficult game. "They came off the back of a 6-1 defeat last week and it certainly makes them come out and fight a bit harder, but it was a strange first half. "Jon McLaughlin has picked the ball out of the net twice and had nothing else to do." Match ends, Rochdale 2, Burton Albion 1. Second Half ends, Rochdale 2, Burton Albion 1. Joseph Rafferty (Rochdale) wins a free kick in the attacking half. Attempt missed. Mark Duffy (Burton Albion) right footed shot from long range on the right is high and wide to the right. Attempt missed. Timmy Thiele (Burton Albion) header from the centre of the box is high and wide to the left following a corner. Corner, Burton Albion. Conceded by Joseph Rafferty. Attempt blocked. Tom Naylor (Burton Albion) right footed shot from outside the box is blocked. Attempt missed. Jamie Allen (Rochdale) right footed shot from outside the box misses to the right. Attempt blocked. Ian Henderson (Rochdale) left footed shot from long range on the right is blocked. Substitution, Rochdale. Calvin Andrew replaces David Syers. Damien McCrory (Burton Albion) wins a free kick in the defensive half. Goal! Rochdale 2, Burton Albion 1. Lucas Akins (Burton Albion) right footed shot from the right side of the box to the bottom right corner. Assisted by Shane Cansdell-Sherriff following a fast break. Attempt missed. Oliver Lancashire (Rochdale) header from the centre of the box misses to the right following a corner. Corner, Rochdale. Conceded by Lucas Akins. Foul by David Syers (Rochdale). Substitution, Burton Albion. Callum Butcher replaces Robbie Weir. Attempt missed. David Syers (Rochdale) right footed shot from a difficult angle on the right is close, but misses to the right following a corner. Corner, Rochdale. Conceded by Damien McCrory. Attempt saved. Damien McCrory (Burton Albion) left footed shot from outside the box is saved in the centre of the goal. Lucas Akins (Burton Albion) wins a free kick in the defensive half. Foul by Robbie Weir (Burton Albion). David Syers (Rochdale) wins a free kick in the defensive half. Philip Edwards (Burton Albion) wins a free kick in the defensive half. Robbie Weir (Burton Albion) wins a free kick in the defensive half. Foul by Jamie Allen (Rochdale). Corner, Burton Albion. Conceded by Oliver Lancashire. Attempt missed. Damien McCrory (Burton Albion) left footed shot from outside the box misses to the right. Attempt missed. Callum Camps (Rochdale) right footed shot from the left side of the six yard box is close, but misses to the left. Corner, Rochdale. Conceded by Jon McLaughlin.